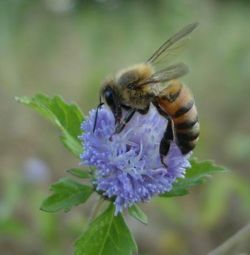 The Africanized bee is a hybrid between African honey bees from Brazil and imported European bees. These bees have earned their nickname of being a "killer" bee because of their aggressive and defensive behavior. Movies have given a whole new meaning to the Africanized hybrid as looking to kill. For a person to actually be killed by the Africanized bee, they would have to be stung hundreds of times and would probably have some sort of allergic reaction. On average, a person can handle 10 stings for every pound of body weight. Thus, even though a child could die if stung 500 times, an adult could handle more than twice that amount. There has only been one recorded killing by bees and the chances of this happening are very slim. When a bee stings the venom sac, and part of the digestive system, is pulled out with the stinger. The thorax is the section of the body where the legs and wings are attached. On the end of all six legs there are tarsi, which tastes the things it touches, and claws and arolia (pad between the claws). The claws and arolia are used to move around on surfaces and to land when flying. The first pair of legs, closest to the head, are used for cleaning the antennae. The second pair are specialized to remove the pollen that is brought into the hive. The third pair have a corbicula (pollen basket) that is used to transport pollen to the colony's hive. In contrast, on top/sides of the thorax there are two pairs of wings used for movement and transportation in the air. Of the two, the pair closest to the head is larger in size than the pair towards the back. The abdomen consists of seven segments that are striped yellow and black. On the underside of the abdomen are glands that secrete wax. These are used to make the hive. The famous part of the bees' abdomen that most people first recognize when coming across a bee is the stinger. Female bees, the queens and sterile workers, are the only ones that have this fascinating appendage. Attached to the stinger is the venom bulb. When a bee stings, the venom bulb detaches from the body with the stinger and continues to pulsate and pump venom into the victim for some time after. The stinger itself is made up of two serrated rods on each side. This rod is injected into the victim and is pushed through by a muscle inside of the bees' abdomen. When a worker stings not only are the stinger and venom bulb left behind, but most times part of the digestive tract is also left attached to the sac. This happens because even though the bee will try and pull free, the jagged sides of the rods will stay in place, thus tearing off of the abdomen. Since the abdomen is torn open the bee will die soon after a sting. During "drone congregations" the Africanized honey bee drones wait for a virgin queen to make an appearance for mating. Because the bee is already a hybrid, the queen may or may not be Africanized or not. The hybrid drones' aggressive behavior and large quantities provide a more efficient mating opportunity with the queen over the European, average, honey bee. When these "drone congregations" occur, the female will leave for her hive with as much sperm to last a life-time. Another way would be a swarm taking over a European colony and either mating with their queen, or killing the queen and replacing it with their own. These Africanized honey bee hives are being fed artificially because of the dry period this season. Africanized honey bees swarming in a mesquite overhanging the wildflower gardens in Arizona. It was decided it was a security risk. This is a European Honey Bee (Apis mellifera), of which, bred with a honey bee from Brazil. 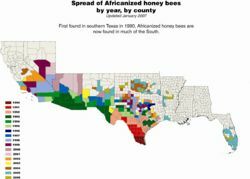 Thus producing the hybrid, Africanized honey bee. Behavior Characteristics of the Africanized Bees, Apis mellifera scutellata by Elizabeth L. Sears. This page was last modified on 3 November 2015, at 16:08.